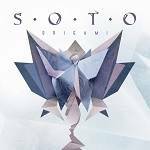 More information: Soto - the group led by acclaimed Sons Of Apollo frontman Jeff Scott Soto (ex Yngwie Malmsteen) - returns with its third album and InsideOutMusic label debut, Origami. The album showcases 10 slices of contemporary and melodic Hard Rock and Metal. Limited edition digipak CD with bonus track.